Photomicrograph (photograph through a microscope) of a human oocyte (egg) that is in the metaphase stage (second stage, during which chromosomes normally align within a cell’s nucleus and separate into two equal numbers of chromosomes) of meiosis I (the first of two nuclear divisions that occur within an egg to result in an egg containing a nucleus that has only half the number of chromosomes normally found in “general body” cells). During metaphase I of an egg’s maturation (MI) the germinal vesicle (the nucleus, an area within the egg’s cytoplasm that appears rounded on light microscopy) is no longer visible and the egg has not yet extruded the first polar body. 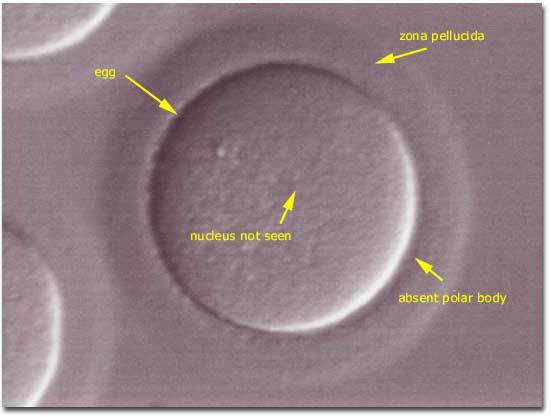 In Vitro Fertilization embryologists generally examine MI oocytes at 2-4 hour intervals and inseminate the eggs a few hours after extrusion of the first polar body.